Breakfast is the first meal of the day. It literally means “breaking the fast” that you’ve been keeping for around 6 to 8 hours since dinner. Through the night, your body has already digested all the food you’ve eaten and now needs more food in order to provide energy. At such a crucial time, it is important to give your body the most nutritious foods possible so that you stay healthy and strong through the rest of the day. 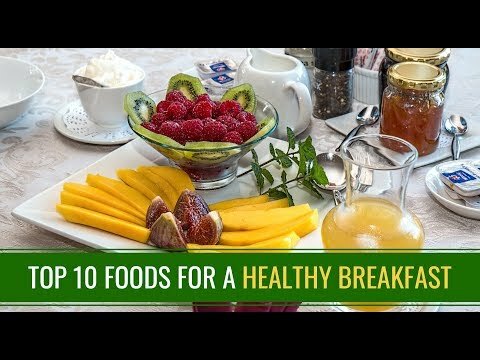 Which is why, we have created top 10 lists for you which adds best food items that you can include in your plan for a healthy breakfast. So get ready to start living a healthier and fitter lifestyle! Milk is a must-have breakfast item, as it nourishes your body in every way. As it is rich in protein, calcium, and vitamins, it will ensure that your body is never working at anything less than its best capacity. Both coffee and green teas contain caffeine, which keeps you alert and improves your mood considerably. It also reduces the risk of having heart problems, strokes, diabetes, and depression. Having a good cup of strong coffee or green tea in the morning will further boost your metabolism and keep you energetic throughout the day. Having smoothies is a creative way of consuming fruits and vegetables without even realizing it! They are a great breakfast option as they are both filling as well as nutritious and will give you all the fiber your body needs. Eggs are packed with proteins, vitamins, and iron, and will keep you healthy and strong. Besides, it will ensure that you don’t feel hungry until lunch-time. Eggs can be prepared in a number of ways, and so, you can be sure that you won’t get bored of having them. Oats are one of the healthiest breakfast items you can opt for. It has antioxidants and vitamins that can lower your cholesterol levels and also control blood sugar. You could have it as porridge, or just eat it with some nuts and honey like a cereal snack. Nuts are an easy option to pop quickly if you are in a hurry but still want to take care of your health. Having nuts for breakfast will satiate your hunger and also give your body the nutrition it deserves. Consuming nuts, especially almonds, on a daily basis is also said to improve memory and increase mental productivity. Berries are rich in antioxidants, vitamins, and minerals. Though they are sweet, they are good for your health as they have very low calorie content. Berries double up as a tasty and healthy breakfast food and can be had in various combinations to make your breakfast more exciting and enjoyable. Eating bananas for breakfast will ensure that you feel full for quite some time as they have rich fiber content. With its high potassium and calcium levels, this easy breakfast fruit will also give you a good amount of vitamins and minerals that will help maintain your health. Honey is a natural and healthier substitute for sugar. Its antioxidants will lower your blood pressure, reducing the risk of heart disease, and will also prove to be very useful in relieving you of symptoms of a cold or a sore throat. This morning dairy treat is pro-biotic and contains good bacteria that maintain the health of your gut. It is also high in protein and bone-building calcium, which makes it a great source of nutrition for your body. It’s time to focus on eating right; especially for the most important meal in the day. So don’t forget to include these wonderful foods in your breakfast, to take care of your body in return for all that it does for you. It is better if you avoid skipping the first meal of the day as it reduces and affect your level of energy required throughout the day, start your morning with top 10 foods for breakfast, suggested by WeBeingFit.